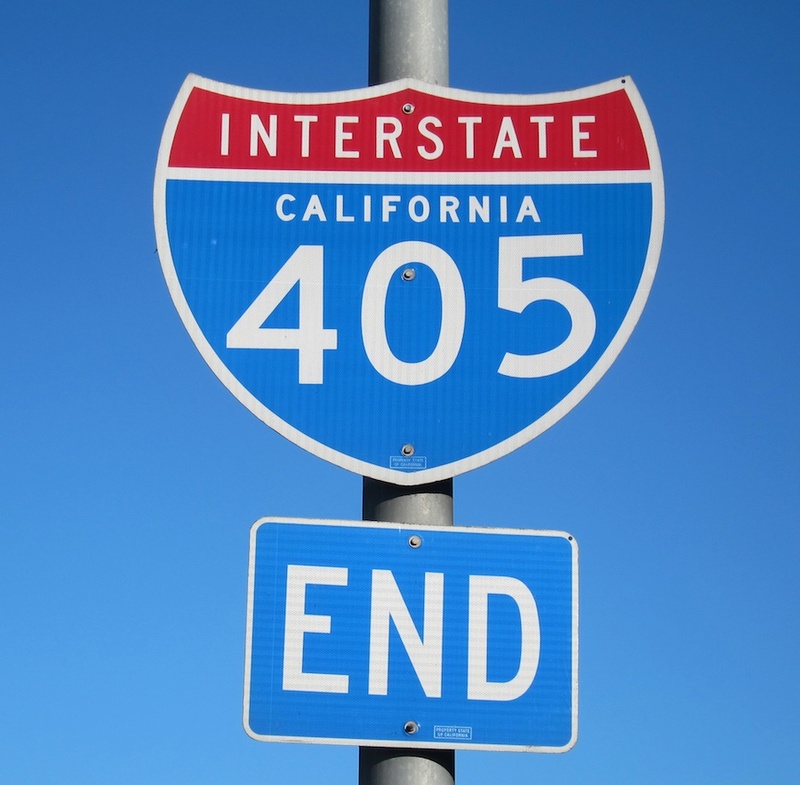 The end is in sight for the 405 improvements project. 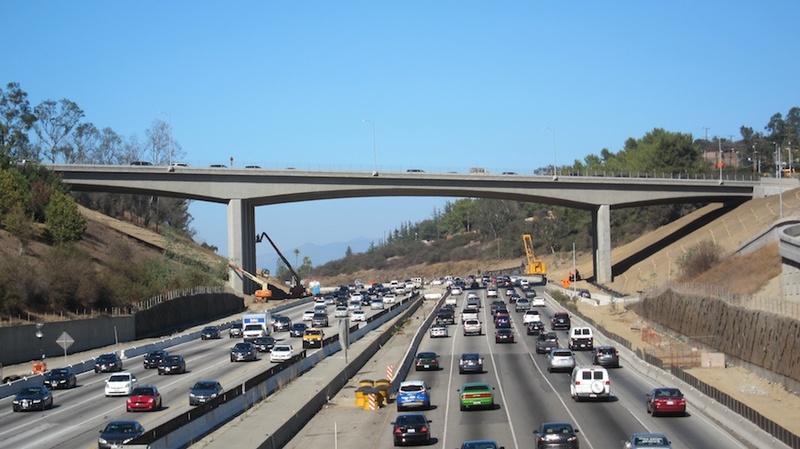 Good news from the I-405 Sepulveda Pass Improvements Project, which has successfully navigated through some considerable obstacles during construction of a 10-mile northbound HOV lane between the 10 and 101 freeways. Project managers now report that the project is officially 85 percent complete, with major milestones planned before the end of the year. The project that brought the public the “Carmageddon I and II” mega-closures in 2011 and 2012, respectively, was originally scheduled to open in May of this year. However, retaining wall problems, utility relocations, legal challenges, problems with procuring needed rights-of-way and efforts to avoid a county storm drain, among others, have required extensive mitigation efforts. The project team continues to open parts of the project as soon as they are ready and safe for public use — but the entire project won’t be done until the middle of next year. The Design-Build delivery method used to build the I-405 improvements has allowed design and construction to occur simultaneously, shaving up to seven years off the construction schedule compared to traditional Design-Bid-Build methods, but even still the unavoidable project delays and cost increases have taken a toll on public patience. U.S. Congressman Henry Waxman recently queried the U.S. Department of Transportation regarding the federally funded project and its delays, asking how the project could be completed as quickly as possible. Anthony Foxx, Secretary for the U.S. D.O.T responded to Waxman in an August letter, reporting that retaining walls and utility relocations were primary sources of project delays. “All these delays are unfortunate, but I want to emphasize that the Federal dollars invested in this highly complex project are being properly expended,” Foxx wrote. The project team, which consists of Metro, Caltrans and Kiewit, are now working as quickly as possible to finish remaining deliverables. The team has already completed major improvements like the brand new, higher capacity Sunset Bridge, three miles of northbound general purpose lane between the 10 Freeway and Wilshire Boulevard, the widening of Sepulveda Boulevard and undergrounding of all utility lines in the Westwood area, and most on and off-ramps, retaining and sound walls, underpasses and structures. The reconstructed Wilshire Interchange will have 75 percent greater capacity. The massive octagon loop of ramps that connect to the I-405 from Wilshire Boulevard all will be complete. Several of the new ramps will have substantially higher capacities than the ones they replaced, including two massive “flyover” ramps for motorists entering the northbound I-405 from eastbound Wilshire and motorists exiting the freeway from southbound I-405 to eastbound Wilshire. All ramp improvements combined increase the capacity of the Wilshire Interchange by a whopping 75 percent. New Northbound I-405 off-ramp to Sunset Boulevard now under construction. When done, it will have 60 percent greater capacity. Metro’s contractor completed building a widened, heightened, lengthened and extra capacity Sunset Bridge in September 2012. 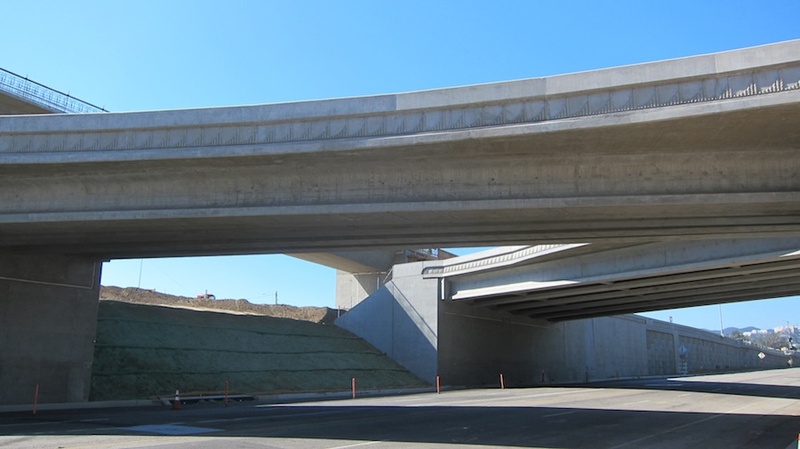 Earlier this year, the project opened a newly built on-ramp to northbound I-405 at Sunset. By the end of the year, the dreaded 120-day closure of the northbound I-405 off-ramp at Sunset will end, increasing the capacity of the ramp by 60 percent. The extra capacity will benefit drivers traveling to the busy Westwood/UCLA area. The seismically updated Mulholland Bridge now allows the construction of a extra traffic lane below. The “Carmageddon” Bridge will celebrate its completion as well. Contractors have poured all concrete for the bridge span and are now completing the portions of street that approach the bridge on both sides. The new bridge has four support columns rather than the original three, and those columns are now properly positioned to accommodate an extra traffic lane underneath on the I-405. Motorists living in Santa Monica Mountain communities between the Westside and San Fernando Valley will soon be able to traverse this bridge without onerous nightly closures or daytime lane reductions. That’s encouraging; may I just make one recommendation as someone who lives and works in Westwood? Paint the crosswalks on Wilshire between the sidewalks and entrances/exits of the freeway with hashed lines (like at major crosswalks). People walking from Westwood to West LA face peril every day. The article says Sunset off-ramp to be complete “By the end of the year.” The contractual 120 closure expires on November 30. Does this mean by your article that this ramp is behind schedule? Could you pleasure clarify. The ramp was closed on August 2 or 3 and 120 days would be November 30 or December 1. I believe there are penalties associated with going beyond the 120 days. Would really appreciate clarification. Thank you. We appreciate your eye for detail. 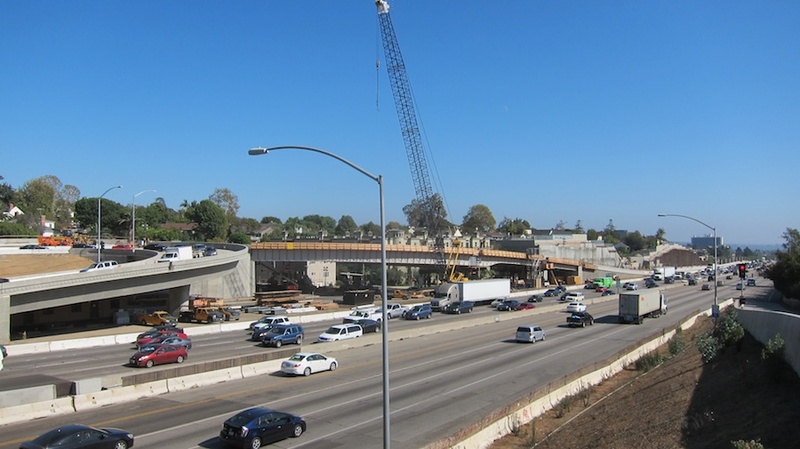 Yes, December 1 marks the end of the 120-day closure of the northbound off-ramp to Sunset Bl. We will be opening the northbound off-ramp by that date. We hope to complete the rebuilding of the ramp earlier, but we don’t want to advance a date until we are sure. We will announce an opening date soon. Increased capacities of 60 to 75% will likely just move the traffic jam somewhere else. It always does. Why isn’t more manpower being thrown on the project to complete it closer to the original schedule? The public continues to lose thousands and thousands of man hours sitting in gridlock while a small work force is scattered along the project at anyone time. Pull resources from other projects and get working 24/7! End the anguish that you’ve put Valley and Westside residents through and start opening completed sections ASAP! The current 85% complete seems to be a long way from the 100% goal as far as traffic mitigation. No relief so far!